As I’ve said on here previously, I’m not too much of a Star Wars guy. I get why people love it, and I understand the obsession. I also like it a good amount–I’ve seen all the movies multiple times and own a few of the comics and books–but by and large, it’s just not for me. But what with the recent news of the Expanded Universe–the vast, interconnected network of Star Wars novels, games and comics–being declared noncanon by Disney and the need for me to ingest something else besides Star Trek this summer, I’ve gotten interested. Plus, I’ve rewatched this very entertaining video about the EU by Internet personality Nash about 5 times and it’s piqued my curiosity enough that I’m intrigued about the EU again (Video slightly NSFW). 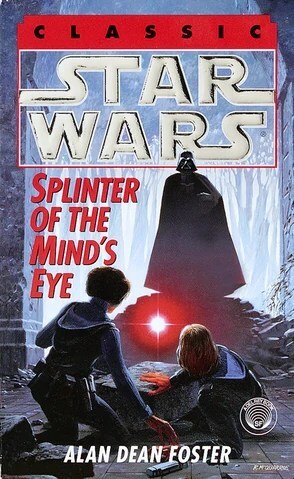 With that in mind, I decided to check out from my library the first ever EU novel, Splinter of the Mind’s Eye. Written by SF legend Alan Dean Foster, it’s a gripping treasure hunt story that offers a fascinating glimpse into what the Star Wars universe was like in its early years, for good and for ill.
Set 2 years after the events of A New Hope, the story opens with Luke, Leia, R2-D2 and C-3PO on their way to the planet of Circarpous IV to secretly convince the inhabitants–and hopefully the inhabitants of another system–to join the Rebellion. Unfortunately, as they pass Circarpous V, Leia’s ship begins malfunctioning and she’s forced to make an emergency landing. Luke follows and they both crash in separate areas of the thick swampy jungle of the planet (which is called Mimban by its inhabitants). Making their way towards each other and realizing that they’re on a mining planet, they begin to follow a beacon thinking it’ll lead them to an outpost station that they can call for help from, they instead come across a mining town. After stealing clothes to blend in, they enter an inn where an old woman named Halla approaches them. She quickly susses out who they are and forces them to, in exchange for getting off the planet, team up with her to find something called the Kaiburr crystal (the “Splinter of the Mind’s Eye”), a legendary gem hidden in a temple that is said to increase one’s Force power to 100 times its max. She shows them a small sliver of it she acquired. Luke realizes it’s the real deal and they agree to help. It’s plenty odd to read this novel for a lot of reasons. For one thing, Imperial stormtroopers are described as being “both men and women.” which makes sense in context. But it’s mostly odd when one considers that, according to the prequels, all stormtroopers are clones. And male clones are that. Furthermore, the way the book ends is WILDLY contradictory to the way the rest of the original trilogy plays out. But the big, awkward, banjo-playing elephant in the room is the sexual tension between Luke and Leia. On the one hand, it’s a natural growth of Luke’s feelings towards Leia in the first film and we get a more nuanced look at how both parties feel towards each other. But on the other hand, it’s REALLY awkward considering we learn the two are siblings by the end of Return of the Jedi. That unpleasantness aside, this book is still a solid adventure story and is true to these characters and this mythos, at least in its nascent form circa 1978. As the Nash video explains (and seriously, you really should watch it; it’s pretty great), Splinter was commissioned by George Lucas to serve as the basis for a lower-budget sequel in case the first film didn’t succeed. If you’re willing to overlook some awkward elements in order to read a fun adventure story about characters you know and love, it’s worth a look. I don’t even think I need to put a link to this news, since the entire Internet pretty much collectively has blown up about it. But, just in case you didn’t know, Disney announced last week, with rumors leaking on Thursday and their confirmation on Saturday, that the director chosen to bring Michael Arndt’s script for Star Wars: Episode VII to the screen is none other than…J.J. Abrams. Now, while a lot of respectable and smart people have made their fears and frustration known about this, I’m actually really excited. Why? Well, because I think Abrams has that same sort of visual flair that early Lucas had and because…and this is really important…he’s a Star Wars fan. BIG TIME! 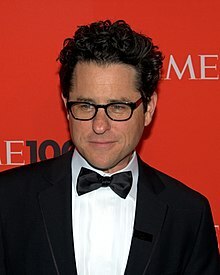 Even though Abrams’ biggest box office success as a director is undoubtedly his 2009 reboot of Star Trek (which, among other things, kept the brand alive and helped introduce ME to it), he went into the project as having been a Star Wars kid in addition to having only a general knowledge of the franchise. Ultimately, that general sense of the iconography, along with a script that proved Roberto Orci and Alex Kurtzman can actually write (when they’re not working with Michael Bay), is what helped make the film a success with mainstream audiences. Now, Abrams as a filmmaker has really only made one original movie: 2011’s Super 8. But that film tells you everything you need to know about where he comes from; the main character, a kid named Joe with a love of making movies, monsters and special effects is undoubtedly drawn from Abrams. And y’know what? I bet you anything that, if he could without everyone breathing down his neck and cursing his name all the time, George Lucas could have made that movie too. heck, he probably even WAS that kid too! And for all of you joking about smoke monsters and polar bears or whatever, y’all need to remember something; Abrams is directing but not writing. He’s working off of a treatment and future script by Michael Arndt, an Oscar-winning screenwriter who, in his screenwriting workshops, uses A New Hope as the example of a perfect screenplay. Whatever Arndt has written, it must be powerful, because his story is what helped make the Disney/Lucasfilm deal happen. Episode VII hits theaters in 2015. I’ll be there and so will probably a lot of you. Till then, may the Force be with you. So, if you’re like me and place way too much importance on this sort of thing, you know that this week, the Walt Disney Company paid George Lucas $4.5 billion dollars for his company Lucasfilm, which gives them the rights to, among other things like Industrial Light & Magic and Skywalker Sound, the Star Wars franchise. And the long-rumored Episode VII is coming out in 2015, with a film to follow that every two years. I found out about this through oblique references online before I actually found out the news story and honestly…I’m fine with it. I really am. Let me back up here: I am not a HUGE Star Wars fan. I mean, I own all the movies, I like them (for the most part), I’ve read a few Expanded Universe novels, a bit of the excellentStar Wars: Legacy comic, I dressed up as Darth Vader for Halloween when I was little, I’ve played some video games and the Emmy-award winning, yet darn near impossible to find on DVD Star Wars: Clone Wars show is still on my list of things to watch…but I’m not a BIG fan. I don’t think it’s the best SF franchise out there, I don’t think it’s one of the best fictional universes out there and frankly, a whole lot of Star Wars stuff out right now doesn’t particularly interest me. But this announcement DOES and here’s why. I was in high school when Disney bought Marvel Comics and at the time I groaned and joked about it like everyone else, but this? This makes total sense. If one looks at the original trilogy, even the first film (which I did just last weekend for a class), it’s a very broad story. The characters are archetypes through and through and the story is about as predictable as it gets. George Lucas (who, if you look at his biography, is more of a visuals guy than a storytelling guy)has said on many occasions that he was inspired to make the first film in a homage to all the pulpy Westerns and SF serials he loved as a kid and I bet classic Disney films had some influence on that as well. They specialize in telling simple stories (heck, a large part of their animated features catalogue is culled from fairy tales), they know how to make characters that appeal to a broad group of people and–and this is the most important part–they know how to line up talented people and let them do their thing. This is the third huge franchise Disney has bought since the start of the 21st Century, with the Muppets before them in 2005 and Marvel in 2009. In the cases of both, when it came time to make movies, Disney put people who LOVED the franchise and understood it (Jason Segel and Nick Stoller for The Muppets and, among other people, Joss Whedon for The Avengers respectively) in charge and let them do pretty much as they saw fit. Considering that, and considering the phenomenal track record Disney has had by adopting that model–plus the sheer amount of Disney-affilated names who’d LOVE to write or direct anything to do with Wars (Andrew Stanton, Brad Bird, etc. )–I’m excited to see what they do. There’s more fun things to get excited about and one thing to keep in mind that drew McWeeny–one of my favorite film critics/insider Hollywood guys–chronicles here and here. Got to tell you, with this new Star Wars film, The Avengers 2 and Justice League–a little hopefully on that last one–all coming out in 2015, when I graduate college, it’s a great day to be a nerd.